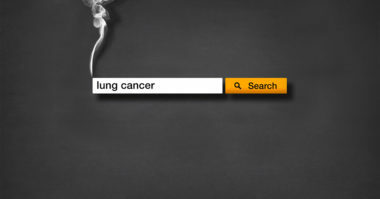 What do pieces of health-related content that rank well in Google search have in common? Which search engine optimization tactics are especially effective for healthcare brands? To find out, Searchmetrics conducted an in-depth study. The researchers looked at the top 20 search results on Google.com for over 6,000 common health-related search terms such as “atkins diet,” “BMI calculator,” “lyme disease symptoms,” and “spider bites.” They then identified which content and technical characteristics these top-ranking pages had in common. This analysis focused in particular on how top healthcare content differed from well-performing content overall. In other words, the researchers looked for which factors mattered more in the health industry than in other industries (you can check out their findings for other verticals here). 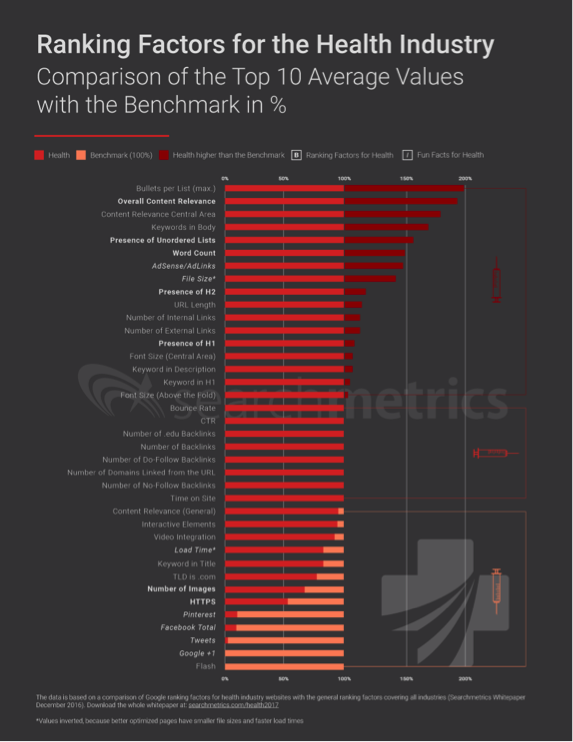 As you can see, the analysis found that top-ranking health sites differ in a number of ways from top-ranking sites in general, including that they tend to have smaller file sizes, load slightly slower, and deliver more ads. While those learnings are somewhat interesting, the most important takeaway from the research is that the most influential health site factors—those with an oversize impact on performance compared with other industries—are all related to one thing: content. The researchers found that content relevance—how related the information on a page is to a search query—is not only higher for health pages relative to the overall benchmark, but that it is also higher compared with any other industry. In other words, people searching for health-related content really, really, really want the pages they find via search to contain highly pertinent information. This makes intuitive sense. Whereas someone looking to learn about a vacation destination might be okay with a search result that isn’t exactly what they expected, someone looking for information about a disease is likely to be far less forgiving. The analysis found that health-related pages that rank in the top 20 Google search results are 43% longer—685 words longer—compared with top-ranking pages across all industries. Moreover, health-related pages that rank in the top 10 Google search results are 50% longer compared with the benchmark. Conversely, top-ranking health-related pages contain only one large image (bigger than 200 x 200 pixels), on average, compared with 1.6 large images, on average, for top-ranking pages across all industries. This doesn’t mean that consumers don’t care about visuals for health-related content. Rather, it means that they tend to prioritize detailed, expert analysis. A slideshow of big photos may be great for Oscars red carpet coverage, but when it comes to explaining a health treatment, a detailed text explanation appears to matter more. Some 91% of health-related pages that rank in the top 10 Google search results make use of header (H1 and H2) tags. This is significantly higher compared with benchmarks for other industries. Along similar lines, 88% of health-related pages that rank in the top 10 Google search results use unordered (bullet point) lists. This compares with only 56% of top 10 pages across other industries. The presence of headers and bullet point lists is tied to content length. Consumers apparently prefer health-content that is lengthy, but they don’t want these pieces to be giant blocks of text. Rather they prize content that is both detailed and structured, which guides the experience and is easy to consume. When you take all these content factors together, a clear picture emerges: consumers want health-related sites to present in-depth information that is well structured and highly relevant to what they’re searching for. For healthcare brands, this means that succeeding on search is increasingly synonymous with succeeding with content. Simply put: if you’re able to deliver pieces that are detailed, authoritative, and easy to read, then you’ll have a much higher chance of ranking well on Google. Stay up to date on the latest healthcare marketing tactics. Contact MDG Advertising today at 561-338-7797 or visit mdgadvertising.com. MDG Advertising, a full-service advertising agency with offices in Boca Raton and New York, NY, is one of Florida’s top healthcare marketing companies and branding firms, whose healthcare clients include Dental Care Alliance, MDVIP, Max Planck Florida Institute, HCA East Florida, Primary Pharmaceuticals, and FastMed Urgent Care. MDG’s core capabilities include branding, logo design, print advertising, digital marketing, mobile marketing, email marketing, media planning and buying, radio and TV advertising, outdoor, newspaper, video marketing, infographic development, website design and development, content marketing, social media marketing, and SEO. To learn more about the latest trends in healthcare marketing, contact MDG Advertising today at 561-338-7797 or visit mdgadvertising.com.